Fertilization and ookinete RFP expression in female gametes, zygotes and ookinetes (male gametes are GFP positive). The mutant expressses GFP under control of the male gametocyte specific promoter of PB000791.03.0 (dynein heavy chain, putative) and RFP under the control of the 'female gametocyte specific' promoter PB000504.02.0 (LCCL domain-containing protein CCP2). 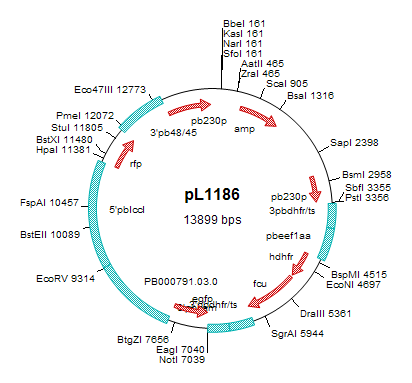 The rfp and gfp genes are stably integrated into the genome in the 230p locus. The mutant does not contain a drug selectable marker which has been removed by the negative selection procedure using the negative selectable marker yfcu (yeast cytosine deaminase and uridyl-phosphoribosyltransferase) and the drug 5-fluorocytosine (5-FC). No GFP and RFP expression in asexual blood stages. No RFP expression in male gametocytes. Stage specific RFP expression in female gametocytes, female gametes, zygotes and ookinetes. No GFP expression in female gametocytes. Stage specific GFP expression in male gametocytes (male gametes are GFP positive). This mutant can used to determine fertilisation of female gametes and meiosis in zygotes by FACS analysis. Female gametes/zygotes express RFP allowing for FACS selection of the RFP-positive females to be analysed. Before FACS analysis live cells are stained with the DNA specific dye Hoechst 32258 to measure DNA content and determine the ploïdy of female cells by FACS analysis (Ponzi, M. et al., 2009, Cell. Microbiol Apr 30). The mutant does not contain a drug selectable marker. This mutant can therefore be used for the introduction of additional genetic modifications using vectors that contain drug-selectable markers. The drug selectable marker used to introduce the rfp-and gfp-expression cassettes, a fusion gene of hdhfr and yfcu, has been removed by the negative selection procedure using the negative selectable marker yfcu (yeast cytosine deaminase and uridyl-phosphoribosyltransferase) and the drug 5-fluorocytosine (5-FC). RMgm-127: A mutant expressing GFP under the control of the promoter of PB000504.02 ('female gametocyte specific'). RMgm-130: A mutant expressing GFP under the control of the promoter of PB000791.03 ('male gametocyte specific').